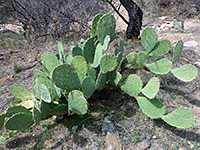 Opuntia engelmannii is perhaps the most widespread of all prickly pear cacti, ranging from southeast California all the way to Mississippi, and is also one of the largest, with light green or bluish green pads up to 12 inches across, forming sizeable clusters several feet tall. Mature clumps have no central trunk, instead spreading at ground level; lateral pads take root readily, enabling the plant to colonize a big area, up to 30 feet across. The white (occasionally yellow) spines grow from widely spaced areoles in clusters of 2 to 6 and always point downwards. Glochids are quite prominent. 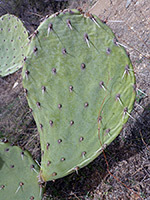 Spines are shorter than all similar opuntia species, at most one inch long. The large yellow flowers which bloom in springtime are followed by purple-red fruits. New pads are bright lime green and the areoles bear small, thin leaves, which soon drop off as the spines start to develop. There are several varieties of opuntia engelmannii, of which the most distinctive is var linguiformis (cow's tongue prickly pear), where the pads are very elongated, up to three feet, wide at the base becoming thinner towards the tip. This plant grows in the wild in a number of locations in south Texas, and around Tucson in south Arizona, but all populations may be introduced rather than native. Another variety, lindheimeri, the Texas prickly pear, is now considered a separate species (opuntia lindheimeri).